You left your car lights on and now you go to start your car and nothing happens. Maybe a slow turn over then you hear a bunch of clicks. This is when you need to jump start your car battery. Here’s how to jump start a car with jumper cables. BTW. This is not difficult. There is one all important safety rule however, that I will go into more in this post. With this tried and true method you need another running vehicle. Which often means flagging someone down and asking them for a jump start. This is the exact reason I carry a portable jump starter in my car. You might want to carry one too. These are two portable jump starters that I like and use. The Powerall Portable Jump Stater and [easyazon_link asin=”B000JFJLP6″ locale=”US” new_window=”default” tag=”carbattery0e-20″ add_to_cart=”default” cloaking=”default” localization=”default” nofollow=”default” popups=”default”]The Clore JNC660 ‘Jump-N-Carry’ Jump Starter. [/easyazon_link] Both are good choices. Always make the very last connection the negative cable and attach it to a sturdy metal part of the car frame or body. After the car starts always make that negative cable the first you disconnect. The reason for this important safety tip is this. There can be a build up of hydrogen gas on top the the battery. As you know, hydrogen gas is explosive. Remember the Hindenburg disaster? So to minimize the risk of an electrical spark igniting this gas, and causing an explosion of the battery, the above safety tip must be followed. Believe me, others have ignored this safety rule and ended up with a face full of shrapnel and battery acid! One other thing that some folks do which was okay in older cars but not with newer cars is; to just connect the positive battery cables and allow the two cars two cars to touch bumpers for the negative connection. A couple of problems with this method is; 1, you have to be sure you are touching metal to metal and not just the plastic. 2, most manufacture’s (if not all) do not recommend this procedure as it may damage the rectifier bridge of the alternator. So, Here is the Proper Way to Jump Start Your Car. Bring the running vehicle close enough and in such a way that the jumper cables will reach both batteries. 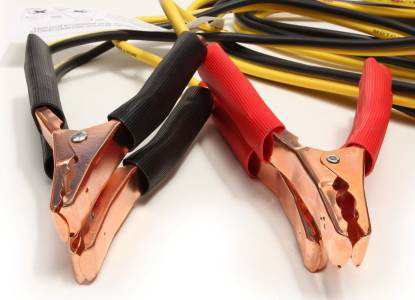 Be sure the jumper cable clamps are not touching each other and hook up one end directly to the positive and negative posts of the battery of the running vehicle. Hook up the positive cable to the positive post of the dead battery. Hook up the negative cable to a solid metal part in the car frame. If the dead battery is stubborn you may need to keep the good car running to give the dead battery a little bit of recharge. After the car is running, disconnect the negative cable that was connected on the sturdy metal part first. After you drive the vehicle for a while, for example drive it back home, and if all you did was leave the lights on, the battery should be fine. If the next day you find the battery dead again you may have other issues going on. You can check my post; Warning Signs of a Bad Alternator – Or Bad Battery, and How to Test a Car Battery for things to check and to look for. Do you have any stories of when you had to jump start your car? Why not leave a comment in the comment section? You can post any questions too. I’ve had my battery die a few times, but have been lucky enough to have other people help me along the way. I guess it’s time to learn!!!! It is frustrating when your won’t start. Thankfully, there always seems to be people around who are willing to help! Thanks for sharing.